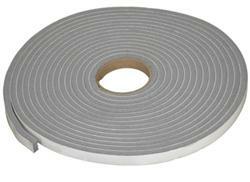 This Macklanburg-Duncan high density foam tape is an inexpensive weatherstripping solution for use on door jambs and on the bottom of window sashes and requires minimal compression for a weathertight seal. To install, simply unroll the foam tape, apply to a clean, dry surface when the temperature is over 40F (4C), press in place, trim to length with scissors and peel off the paper backing. Gray.